Tagged under CLAMP, Production I.G, Series. Kimihiro Watanuki sees youkai and ayakashi spirits. Seeking to get away from the spirits who literally haunt him, he finds himself one day pulled by a force into a shop; there, he meets Yuuko Ichihara, also known as the Dimension Witch, who tells him that this meeting was Inevitable (Hitsuzen). Yuuko grants wishes for the appropriate price. Sensing that Watanuki's dearest wish is to stop seeing spirits, she promises to take the spirits away in exchange for Watanuki working in her home as a cook and cleaner. Bound perhaps by the inevitable, Watanuki agrees. Essentially , xxxHolic is a fine mix of morality with light humor and a bit of storyline as side-ingridients. Every few episodes or so , a morality value which is to be learnt is almost always there , either learning not to lie and stuff like that...you get the idea. The storyline is quite intriuging to a certain extent , further supported by the usage of mythology references to the Japanese culture to keep this alive , if you ARE curious enough anyway. Well , Season I was simply a stepping stone for the later Seasons I believe , I haven't watched the Anime yet but I have read bits of the Manga so more under-elaborated characters would be explained further later on , but definitely not in this Season.
? English voice casting point of view: ? I'am always amazed by the voice of Yuko and how different it sounds from any other role interpreted by Colleen CLINKENBEARD . On the other hand, I can't stop thinking about Keroro every time I hear Watanuki shout or exclaim himself (voiced by Todd HABERKORN). Initially a lil' boring and their extra long body might turn you away but ones you get used to it it's a really fun anime to watch. There are no guys worth mentioning but I really like Yuko she's really the torturer, everything about her is seductive and her fashion sense is really good everything looks good on her, she's a real diva. I really find the vestal sprite cute, she's the shy type which adds more to her charm. Watching this anime made me learn some few valuable lessons. Nothing too special, in my opinion. I'm a fan of supernatural animes but this one is lacking something. It's good if you want to learn more about Japanese folklore, though. I loved Yuuko and Watanuki as characters. The anime was really good.At first it seems like its pointless but as the story goes on it gets better,deeper,darker and sometimes funnier.The story is very sad and the OVAs were fantastic.But to fully appreciate this story you need to read the manga and you also need to see Tsubasa Reservoir Chronicles. The main character is hilarious, and the other major characters fit in well to his personality. I loved the anime at first. But around episodes 4-5, the shows started getting a little boring. There seemed to be less action and more character development, which I felt that it didn't need. I love xxxHOLIC (a lot more than TRC), though, because it doesn't have a direct storyline, some people get bored of the mini arcs. Anyway, xxxHOLIC is comprised of many short stories with recurring characters. The story is linked to TRC and it doesn't have as much importance as Tsubasa. xxxHOLIC is more...philosophical I guess. It delves a lot into folklore and human nature (though to an extreme). It starts off with a very silly atmosphere, while also slightly foreboding as Yuuko is a powerful witch and KNOWS things. As the story progresses, you get to understand the characters more (Yuuko in particular). Of course, since it is linked to Tsubasa, it would be best to read them both to have a better understanding of what the hell is going on. It's quite confusing, but more so on Tsubasa's side. Near the end, things start to get more depressing (also caused by the events occurring in Tsubasa), and you start hoping that somehow, things will improve....but they don't actually. The ending is left rather ambiguously and the audience is free to draw their own conclusion. Overall, xxxHOLIC is quite interesting to read and really makes you think. There's not much action and a lot of explaining so if you're looking for some explosions or something, it's not going to happen a lot in this manga/anime. Even thou xxxHolic got weird anatomy, I still love the series wholeheartedly. It's traditional and supernatural, and it's included in my favorite genre. 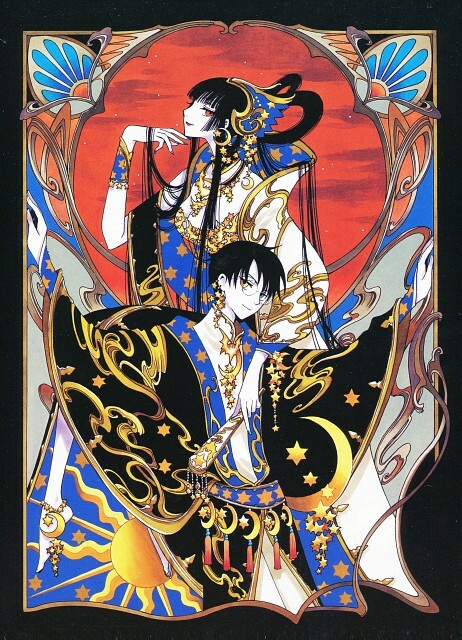 For me XXXholic is like a door into the mysterious world of Japanese folklore. In addition, each series of the anime is more than enlightening and filled with psychological overtones (I even recognized myself at couple of buyers, hope I'v become better now). Story is full of unexpected twists and characters are revealed entirely new side. The ending can be interpreted in different ways, but I quite satisfied with it. Zashiki-warashi and Kimihiro Watanuki Forever! This has got to be one of the most interesting series I've ever seen/read. The story has a nice mix of comedy, drama, suspense and romance(well, sort of? does DouWata even count lolol XD). As for the art, I can say it's just plain beautiful, even if it's quite different from CLAMP's other works. I'm just basing my score on the manga though, I only watched the first season and the OAVs. Second Season: shorter (13 episodes), some have two part episodes while some still have mystery for the day episodes. Ending not too faithful to the manga. They seem to leave a lot out of the anime, such as its crossover with Tsubasa Reservoir Chronicles. While the characters remain much the same, there isn't much story development involved in the episodes I've seen. Yuko Ichihara's wisdom and principles really took me off my bed and got me tuned-in to this series. Every single bit of words she say really does make sense and opens up my mind(though sometimes, magic is included). I wonder what the future episodes show me to fulfill my entertainment and mind feeds cravings.